Writing has always come as easily for me as reading. Now, I find that one of my daughters takes after me while one needs a bit more encouragement to put more than two sentences together on a page. Here, educator Gloria Kopp shares some helpful tips and tricks to homeschool a child who hates to write. Some children take to writing like ducks to water. Others, though, just can’t stand the thought of writing at all. If you’re homeschooling the latter child, don’t give up hope. You can still teach them even if they’re refusing to pick up that pencil. Here’s how you can do it. If your child needs to practice their handwriting, do they need to do it with a pencil? Of course not. There’s plenty of ways they can write without paper. Try filling a shallow tray with rice or flour, and let your child trace letters with their finger. You can also buy individual white boards, and let children write on those. Just changing up the writing materials can help a lot. If the hatred of writing is getting in the way of learning, then remove as much of the writing as you can. After all, if a child is forced to write, that hatred will permeate all of their learning. Instead, try learning out loud, rather than on paper. Have your child dictate stories or essays to you or verbally ask reading comprehension questions. As a homeschooler, you have a lot of options when it comes to educational software. There’s a lot of software designed specifically for reluctant writers. Brave Writer offers online classes, Write Well is designed for essay writing, and Essentials In Writing breaks down the writing process into manageable chunks. Instead of having your child write to record their answers, try making it a game. For instance, you can create a matching game, and have your child match up a picture with a correct answer. This goes really well when you’re learning topics such as coins. As well, you can have your child fill out worksheets with pre-prepared stickers. If your child hates writing, most learning worksheets just aren’t going to cut it. Instead, look for more interesting and innovative materials online. 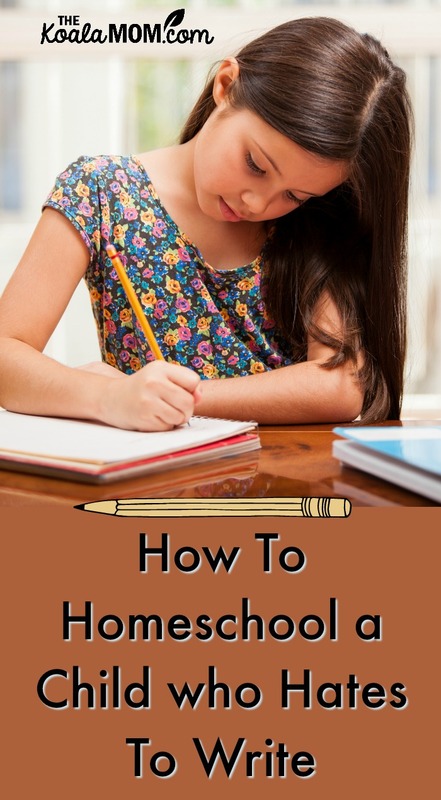 For example, Homeschool has a very helpful list of resources that you can use with your child. Perhaps a colourful book of writing prompts will ignite your child’s imagination. If your child must write, then help them find coping strategies so they can get through it. For example, it may be best for them if they can run around the backyard for a few minutes before they sit down to write, or have music on in the background. Let them find their own strategies, and give them control over the situation. Your child may hate writing essays because the process is difficult for them. If this is the case, find ways to make it easier. For instance, maybe they find it hard to use the pens they currently have. Try using pens that glide more easily, so the child doesn’t feel they’re fighting the pen to write. If they find it hard to hold it, try using a pencil grip to give them more control over it. Your child who hates writing essays, book reviews or short stories may enjoy writing letters to connect with a friend or family member. They could write letters to a friend who has moved away or a long-distance relative. Some children’s magazines will also help connect children with a penpal. An older child may hate writing because they’re so concerned about the mistakes they’ll make in their text. If this is the case for your child, online tools could be the solution. They can give the child the support they need to write, without spending too much time worrying. For example, try using Easy Word Count to highlight and correct errors after a piece has been written, and Paper Fellows to connect with other writers. If writing is such a problem, perhaps it’s time to introduce your child to typing. They may find it much more enjoyable, especially when they get the hang of it, as they’ll be able to write out their ideas much more quickly. Online typing programs can help your children have fun learning to type. Plus, in today’s world of computers, typing is a valuable and practical skill. What is the essay for? Your child may balk at writing assignments or essays that are just going to get read by you or their homeschool teacher, and then tossed in the garbage. A child may be more motivated to write if they see a purpose. For example, my oldest daughter dislikes writing—but was very excited to write a story for our homeschool board’s anthology and to submit a story to her magazine’s annual member’s issue. Look for writing contests for children, places that publish children’s work, or other ways to give your child a purpose for writing. These tactics will help you educate your child even when they don’t want to write. Give them a try, and show your child that writing doesn’t have to be a part of their entire education. What tips or tricks would you share to homeschool a child who hates to write? Gloria Kopp is an educator and an e-learning consultant from Manville city. She graduated from University of Wyoming and started a career of business writer, now she works as a part-time blog editor at Boomessays. Besides, she is a regular contributor to such websites as Engadget, Huffingtonpost, Academized, etc. These are some great tips. We just started homeschooling this year and my son has difficulty writing and thanks for sharing this post. Great ideas I put my lad on the computer and that helped immensely.